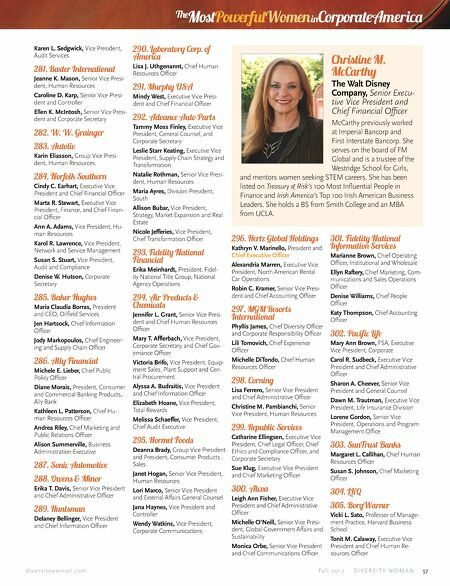 d i v e r s i t y w o m a n . c o m Fa l l 2 0 1 7 D I V E R S I T Y W O M A N 57 e Mt Powerl Women inCorporateAmerica Karen L. Sedgwick, Vice President, Audit Services 281. Baxter International Jeanne K. Mason, Senior Vice Presi- dent, Human Resources Caroline D. Karp, Senior Vice Presi- dent and Controller Ellen K. McIntosh, Senior Vice Presi- dent and Corporate Secretary 282. W. W. Grainger 283. Autoliv Karin Eliasson, Group Vice Presi- dent, Human Resources. 284. Norfolk Southern Cindy C. Earhart, Executive Vice President and Chief Financial Officer Marta R. Stewart, Executive Vice President, Finance, and Chief Finan- cial Officer Ann A. Adams, Vice President, Hu- man Resources Karol R. Lawrence, Vice President, Network and Service Management Susan S. Stuart, Vice President, Audit and Compliance Denise W. Hutson, Corporate Secretary 285. Baker Hugh Maria Claudia Borras, President and CEO, Oilfield Services Jen Hartsock, Chief Information Officer Jody Markopoulos, Chief Engineer- ing and Supply Chain Officer 286. Ally Financial Michele E. Lieber, Chief Public Policy Officer Diane Morais, President, Consumer and Commercial Banking Products, Ally Bank Kathleen L. Patterson, Chief Hu- man Resources Officer Andrea Riley, Chief Marketing and Public Relations Officer Alison Summerville, Business Administration Executive 287. Sonic Automotive 288. Owens & Minor Erika T. Davis, Senior Vice President and Chief Administrative Officer 289. Huntsman Delaney Bellinger, Vice President and Chief Information Officer 290. Laboratory Corp. of America Lisa J. Uthgenannt, Chief Human Resources Officer 291. Murphy USA Mindy West, Executive Vice Presi- dent and Chief Financial Officer 292. Advance Auto Parts Tammy Moss Finley, Executive Vice President, General Counsel, and Corporate Secretary Leslie Starr Keating, Executive Vice President, Supply Chain Strategy and Transformation Natalie Rothman, Senior Vice Presi- dent, Human Resources Maria Ayres, Division President, South Allison Bubar, Vice President, Strategy, Market Expansion and Real Estate Nicole Jefferies, Vice President, Chief Transformation Officer 293. Fidelity National Financial Erika Meinhardt, President, Fidel- ity National Title Group, National Agency Operations 294. Air Products & Chemicals Jennifer L. Grant, Senior Vice Presi- dent and Chief Human Resources Officer Mary T. Afflerbach, Vice President, Corporate Secretary, and Chief Gov- ernance Officer Victoria Brifo, Vice President, Equip- ment Sales, Plant Support and Cen- tral Procurement Alyssa A. Budraitis, Vice President and Chief Information Officer Elizabeth Hoane, Vice President, Total Rewards Melissa Schaeffer, Vice President, Chief Audit Executive 295. Hormel Foods Deanna Brady, Group Vice President and President, Consumer Products Sales Janet Hogan, Senior Vice President, Human Resources Lori Marco, Senior Vice President and External Affairs General Counsel Jana Haynes, Vice President and Controller Wendy Watkins, Vice President, Corporate Communications 296. Her Global Holdings Kathryn V. Marinello, President and Chief Executive Officer Alexandria Marren, Executive Vice President, North American Rental Car Operations Robin C. Kramer, Senior Vice Presi- dent and Chief Accounting Officer 297. MGM Rorts International Phyllis James, Chief Diversity Officer and Corporate Responsibility Officer Lili Tomovich, Chief Experience Officer Michelle DiTondo, Chief Human Resources Officer 298. Corning Lisa Ferrero, Senior Vice President and Chief Administrative Officer Christine M. Pambianchi, Senior Vice President, Human Resources 299. Republic Servic Catharine Ellingsen, Executive Vice President, Chief Legal Officer, Chief Ethics and Compliance Officer, and Corporate Secretary Sue Klug, Executive Vice President and Chief Marketing Officer 300. Alcoa Leigh Ann Fisher, Executive Vice President and Chief Administrative Officer Michelle O'Neill, Senior Vice Presi- dent, Global Government Affairs and Sustainability Monica Orbe, Senior Vice President and Chief Communications Officer 301. Fidelity National Information Servic Marianne Brown, Chief Operating Officer, Institutional and Wholesale Ellyn Raftery, Chief Marketing, Com- munications and Sales Operations Officer Denise Williams, Chief People Officer Katy Thompson, Chief Accounting Officer 302. Pacific Life Mary Ann Brown, FSA, Executive Vice President, Corporate Carol R. Sudbeck, Executive Vice President and Chief Administrative Officer Sharon A. Cheever, Senior Vice President and General Counsel Dawn M. Trautman, Executive Vice President, Life Insurance Division Lorene Gordon, Senior Vice President, Operations and Program Management Office 303. SunTrust Banks Margaret L. Callihan, Chief Human Resources Officer Susan S. Johnson, Chief Marketing Officer 304. LKQ 305. BorgWarner Vicki L. Sato, Professor of Manage- ment Practice, Harvard Business School Tonit M. Calaway, Executive Vice President and Chief Human Re- sources Officer Chrtine M. McCarthy The Walt Disney Company, Senior Execu- tive Vice President and Chief Financial Officer McCarthy previously worked at Imperial Bancorp and First Interstate Bancorp. She serves on the board of FM Global and is a trustee of the Westridge School for Girls, and mentors women seeking STEM careers. 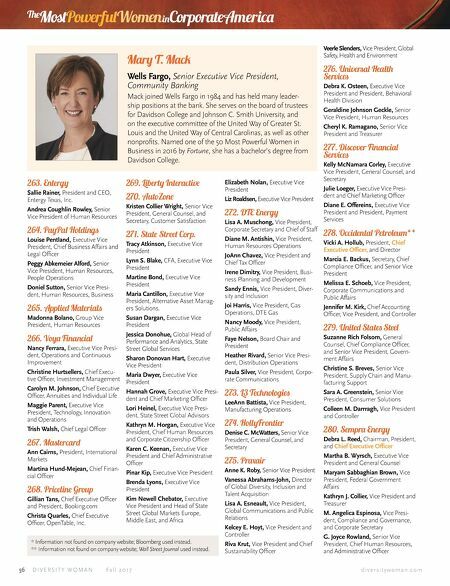 She has been listed on Treasury & Risk's 100 Most Influential People in Finance and Irish America's Top 100 Irish American Business Leaders. She holds a BS from Smith College and an MBA from UCLA.